"There's some sort of creature below me ..."
This is Morgan Saxton, a skilled reporter for KUTV News in Salt Lake City, Utah. As a journalist covering stories in the field, it's her job to shed light on the facts — but this week, Saxton encountered something she couldn't quite nail down. And it all happened while live on the air. On Wednesday morning, smack-dab in the middle of her report on some recent flooding in the region, Saxton found herself being approached by a shadowy figure emerging from the darkness. Breaking from her script, Saxton identifies the creature as a dog at first, but then second-guesses herself. "I think it's a dog. I'm not sure," she said, trying her best to maintain composure, adding: "There's some sort of creature below me." The mysterious, long-tailed creature walks uncomfortably close past Saxton before slinking away into some tall grass — and soon people watching began to speculate about just what kind of animal it was. A dog? A mountain lion? Something else? Wildlife officials decided to weigh in on the subject, too — and even they were stumped by the footage. Our biologists are trying to determine if the animal was a cougar. From the video, it’s difficult to tell. We will visit the scene this morning and look for tracks or any other signs to help positively identify the animal. Being the pro she is, Saxton decided to get to the bottom of this mystery. She helped uncover paw prints from the animal in question — and they pointed to a pup as the likeliest culprit. After more expert input, the question seemed settled. 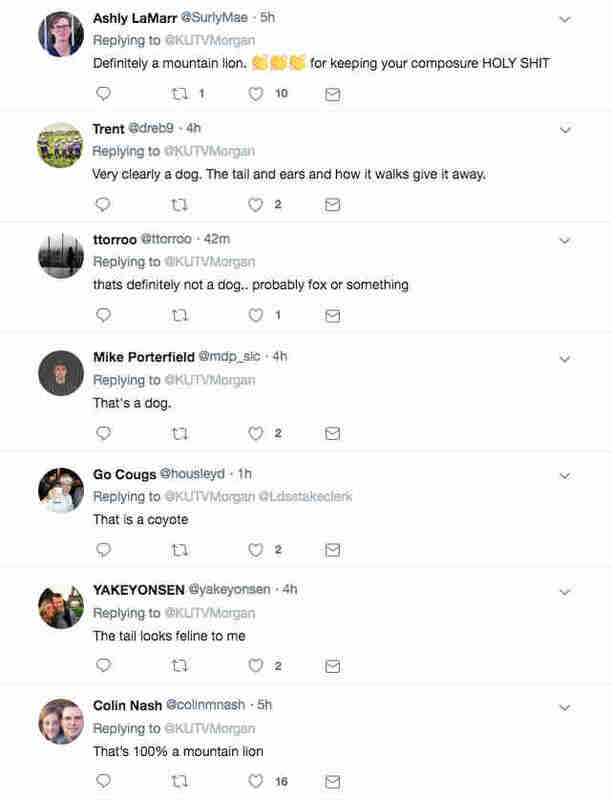 It was a dog, after all. As if that alone weren't enough to put a satisfying bow on the story Saxton hadn't been planning on covering for the day, she actually got to put a face on the dog who'd started it all. Now THAT'S some good reporting.